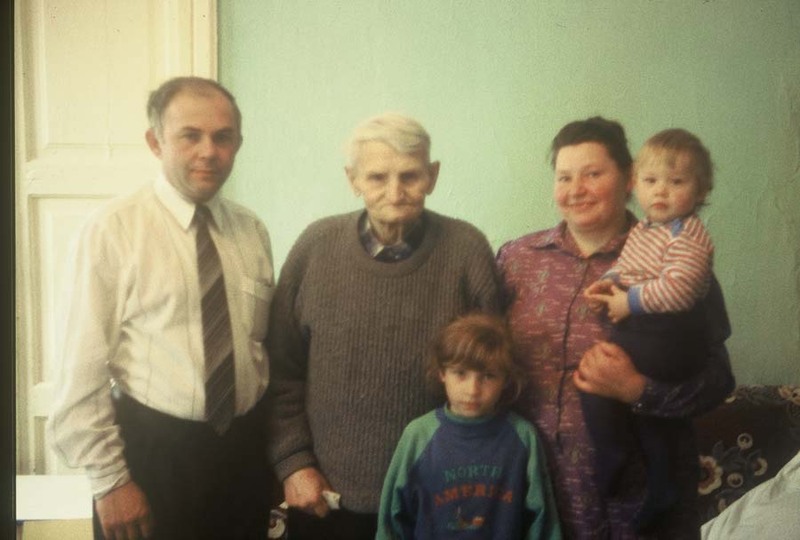 We are delighted to have found the interview we did with this man from Ukraine when we were there in 1995. He was nearly 89 years old at the time. When we returned one year later we discovered that he had died and gone to his heavenly reward. This interview is an attempt to preserve the testimony of one of many thousands who have suffered and died because of their faith. This testimony concerns his life in the 1940s. Interpreter: So when the war began it was in 1941. It was on the 21st of June and on the 22nd of June he was taken to the Army and he left at home, his wife, his three children. His wife was pregnant. She was going to have another child. Brother Mark: This was 1941. Interpreter: He was taken right to the front line. He said (він служив у польській армії), he was the Polish Army. It was from the Western part of Ukraine. It was Polish and it was the Polish Army. He was taken to some camp. Germany had some camps and her boys they took. Brother Mark: You were taken prisoner? Interpreter: Yes, taken prisoner. There was two hundred thousand of them and they were prisoners. It was in Poland. Brother Mark: What was the name of the camp? Interpreter: That was in Chelm city. That is a big city in Poland. He says it is very difficult to speak. He says they were given very bad food and they slept on the floor and every day many people died. From 200,000 people, half of them were not alive, 100 000 of prisoners died. Interpreter: Yes, alive. It was 3 months they were in prison. He was ill (and many of them) and he had scabies and lice and also some kinds of diseases connected with skin. Interpreter: Yes, Scabies. There was no medical unit there. But they made a tent and there were a few Doctors among prisoners and they tried to treat those that were critical. They had no equipment and they had no medicine and they only tried to do what they could. Brother Mark: What they could? Interpreter: Yes. Once they were taken to do some work and they were almost left in prison because they had a bad food. They were taken to one master and they were to dig a well. Interpreter: Yes, they were digging a well for some weeks and it was very deep well. He asked one of the men (he could speak Polish well), this one in the Polish Army, he asked him if there were any believers and he pointed at one man and his wife. And that man came to him every day and he brought him bread. For two weeks he came to him and brought him bread. Sometimes two times a day for two weeks he came to see them and he brought him bread and something else to eat. And thanks to this he survived. He was completely exhausted, he was completely wiped. Brother Mark: These people were not prisoners that brought the food? Interpreter: No, he was out on a detail off of the camp and only the master came to him. That man was not with the camp that brought help to him. Brother Mark: How long were you there? Interpreter: Four months. Meanwhile the prisoner’s wives and relatives of Ukrainian prisoners (Lviv, Rivne and Volyn region) began to think how to get their prisoners home. They asked their local priest to ask the priest of Germany to let them go because they were prisoners. Ukrainian people gathered ransom (given what they could, food, money etc.). So they gave them food and what they could give to their local priests to ask for them the German priests. After four months they let nine hundred people go to the Western part of Ukraine (Lviv, Rivne and Volyn region) and they could go to the most Western part. Brother Mark: Nine hundred people were allowed to be released? Interpreter: Yes. They were released. Brother Mark: Out of one hundred thousand that remained alive? Brother Mark: Okay, so that would be only one tenth of them. Interpreter: It was the first. Perhaps they were the first to return. Brother Mark: So you came home? Interpreter: They walked home from Poland on foot. Brother Mark: All the way? He said that when he was in prison other people accepted Jesus. He preached to them, shared with them and helped them in Jesus. There were German soldiers; they didn’t let them go just so easy. They went with prisoners up to the Poland-Ukrainian border. They drove them as shepherds drive a herd of animals. Brother Mark: They were all marching together. Interpreter: Yes, they were all marching together. They marched with them to the village Novovolynsk (Volyn area), then the soldiers turned back and they could go where they wanted, to their place. He and one man who believed came here. They turned back to that village where he was before prison, and he had a gospel with him, a New Testament that he preached from. Many people gathered at his house. They preached and prayed there. Two villagers came back with him from prison and they have been in the meetings. Brother Mark: So how long were you home? Interpreter: It was up to 1944 that they stayed here. In 1944 he was mobilized by the Soviet army. They had to go to a specific location with the army, but the people called Banderas came to the village. Four days he with his brother were hiding in a pit / in a dugout. They were afraid to be killed or injured by Banderas. The Germans were far from there but they still came because it was not the end of the war. (Now we know these soldiers were called Banderas. They were Soviet armed but redressed. They robbed you. They clearly robbed and they wanted to rob the liberty from their nation. They wanted the liberty and they gave their lives. They wanted nothing but liberty from Banderas and from Fascist and from Soviet. They just wanted Ukraine to be the Ukraine, not under Russia, not under Fascism). – explanation of interpreter. So we were afraid of those who were called Banderas. Who knows whether they will get it or whether the Soviet Army will get it, because they killed people and he had to hide from them. So now Red will take a rest. So they stayed for four days in the ground pit. It was big and deep and there was no food, there was nothing. He had two ways: go to Banderas and they would kill him, or go to the Soviet’s with his hands up. He said they went on foot and he went to the Soviet army to serve. (I don’t know how many kilometers?) Maybe forty kilometers from here where they went with the army. His wife was pregnant again. But they had to walk. They had to march, they had to march to Poland. Brother Mark: In other words he was taken prisoner again? Interpreter: Yes, again, but… he was pulled from his wife and his brother, friend and his family. It was a column of people (a file). It was a long column and they stopped it. He cried. He realized that they had been taken again. Next morning we were taken back to Rinve city. We marched all this time. But the Fascist Germans, they put bombs. In the end it was an awful issue. The next morning they were taken into the train. We were sent (I wouldn’t say to Siberia), but the name of the city was Chkalov which borders Europe and Asia. Brother Mark: The Ural Mountains. Interpreter: Yes, the Ural Mountains were there. Brother Mark: It was close to Siberia. Interpreter: Yes, somewhere close. Where they were taken he started to work as a shoemaker. Some of them were old. They wanted to find something to do somehow, because they didn’t want to go to war. They didn’t want all kinds of things, but some of them. Some of them they took to go onto the war front. But he said, “I am an unbeliever (of warring).” And he started to work there as a shoemaker. Brother Mark: Did they make them ride in the cattle cars on the train? Interpreter: So they took them up and they wanted them to teach how to do with the weapons (how to handle weapons). They wanted them to fill their army. But he refused to take it and he started to work there as a shoemaker, he started to work on shoes. Some people had bad shoes and he started working on his own initiative to help them, to repair it. It was in the field. They were not taken in trucks. The train came and it was a complete wilderness (waste ground). They started there to teach them. It was a place where they taught them to shoot and to deal with weapons. Brother Mark: Did they have to build their own house in the wilderness? Interpreter: There were the barracks and they were made out of wood (with leaves), not from logs. They were like baskets. Brother Mark: Were they warm enough in the winter? Interpreter: (No. Those woven huts were not heated in the winter. – Red). They were able to take refuge there. Most of them were believers, they refused to take up arms and go to war. Almost all of them refused, they stayed only for a month or two (he did not remember…). It was only a time for they were tested. Then they were led to the train and asked, “So, all of you will not go to war? Then we send you to work.” They said, “Yes, we will work!” And then they were taken from there to Gorkovsk region. It is the region of Volga (the river). They were sentenced to 10 years of imprisonment for they did not go to war. They were considered as deserters. They were under judgment for ten years. Brother Mark: Ten years in prison? Interpreter: Yes, he was ten years in prison. When they refused to take weapons they were given ten years. They were like deserters. So there were six from their church, from their community, so there were six believers. Brother Mark: Six believers? From this camp? From this village? Interpreter: Yes. Yes. Yes. But there were very many people in the echelon, it was crowded. So they were now in the Gorkovsk (Virkos) region. They worked there from 1944 up to August 1949. In that year his younger brother died in the camp (a believer). He was five years younger than Red. So they were in prison for ten years and when the war ended they released them and they said they would give them an amnesty (reduced the imprisonment term for five years). So they were in prison for five years there after the war ended. When the power was changing they were sometime kind for prisoners. So he was there in prison for 5 ½ years. You can imagine what kind of a life we had there. We were six from our village, from our church and after these 5 ½ years only three of us were alive. Interpreter: Only three of us were alive. It was his real brother, his blood brother, he died in the camp. He wants you to ask questions. He says it is better if you ask questions. Brother Mark: Yes. What was the food like? Did they give you good food? Interpreter: They didn’t like the shoemaker. They have matter with the wood (tree cutting). They cut the wood, the trees and loaded it too. It was very hard work. Brother Mark: On the trucks? Interpreter: So it was not trucks. There were made rails (but from wood too) like a train (vehicle) that they would ride on, a cart was drawn by a horse pulling on this rails of alder carried them and it was easier to go on this rail. Brother Mark: What did he say about the food? Interpreter: In winter was very heavy snowfall. And even in such bad weather, they were forced to work, for as long as they worked on a tree felling they had only 10 days off. Brother Mark: I didn’t get completely what you were saying here. They didn’t get food? Interpreter: No, no, they didn’t have days off until the war ended. Brother Mark: Now what did he say about the food? Okay. He didn’t answer that. Interpreter: They gave him a ladle of instant oatmeal in the morning and if it is summer they could give him this plant, it is a green plant that if you put it, it bites you (stinging nettle). I don’t know, you Americans probably have it. Brother Mark: Okay. It sounds like rhubarb. A spoonful of oats in the morning: he had to eat the oats raw, or could you cook it? Interpreter: No, they did and they cooked them and they gave him a spoonful of cooked oats. Brother Mark: One spoon. Was it a small spoon? Brother Mark: Nettle! You had to eat nettle? Interpreter: Yes, he said he had to. They made soup from it out of water and nettles. Brother Mark: Water and nettles, that was your noontime meal? Interpreter: No noontime, it was morning – oats and nettle soup. They give it and there was no fat at all in that soup, but for everyone they give a little coffee spoon of some fat. Not cooked because this cook she wants to economize for herself so this coffee spoon had very little, just a drop of fat. I asked about the bread, whether they gave them bread. In the morning they gave him almost a half of a loaf of bread, almost ½ a kilo of bread (converts to 1.1 lb.) only to those who worked heavy and diligently. Brother Mark: And that was to last them all day? Interpreter: No, that was only for the morning. If you worked hard, those who had to load and unload and to carry, they were given this bread. So they were given ½ a piece of bread in the morning. In the afternoon they were given again oats, this spoonful of oats. It wasn’t big he said, it was like just our two normal spoons. Two normal spoons, just like that. He asked the Lord about the death. He said the Lord said to get under the wheels of the carriage that he carried sometimes. That was the cause of the deaths sometimes. It was so difficult and damaging. Interpreter: Yes. So these carriages, I don’t know if you have some. We felt that if we measured wood we measured it in cubic meters. One cart could contain 3.5 cubic meters of wood. Brother Mark: We measure it by the cord, but it is the same thing. Interpreter: So it is three big meters of wood. So he didn’t ask about the death. He said God give me the carriage so that I could like under it to rest. Not to have eternal rest, but more that he could have a rest. But at that time it was on the rail and his foot somehow slipped. It was under that rail and that carriage and that went on his foot and it went on his foot. Brother Mark: It crushed his foot. Interpreter: Yes. He said that fortunately he was in thick boots (felt boots). We call them valianky and they are very thick. His foot swelled up. So he had two weeks of rest. He said he had to go to the doctor in two weeks that the swelling was down, but he wanted to stay a little longer and he hit himself again. Brother Mark: He hit his foot with a spade and cut his foot? Interpreter: He wanted, he made it swell again. Not – he didn’t cut, but he made it swell again. In three years he himself took out 10,000 cubic meters of wood. In 3 ½ years he took out 10,000 cubic meters of wood. You can ask some other questions. Brother (Tom Campbell): Because he was a Christian, when they found out he was a Christian did they persecute him more? Interpreter: He said, no. They were equal to everybody. There were believers and there were non-believers, but they all did this work. They were seventeen like detachments and they had several people, very many. They had a multitude of people in the camp. Brother Mark: Were they able to read the Bible and pray together with other believers? Interpreter: They didn’t have time. From dark to dark they had to work. When they came back he had to take the water and he had to take some branches on the floor, not a bed they were on the floor and he had to water them because there was a kind of insect that was on them and they were afraid of water. There on wet branches he slept. Brother Mark: They slept on wet branches summer and winter? Interpreter: No. In winter they had some wooden, we can’t say beds (plank bed), but that wood had bedbugs. Some pieces of wood were put on the floor. He could lie there, but he preferred to take some branches and sleep there because this insect couldn’t come there when there was a water. Brother Mark: Some kind of lice or ticks or something. The war ended. They had one day off, it was Sunday. When this day came they started to meet together and to preaching. Brother Mark: How did your wife bear this? Did she know you were alive? Interpreter: My wife knew about this but she could do nothing. When the war ended he was the first in this numerous camp (prisoners) who receive a parcel from wife. He is very proud that his wife cared about him and sent a parcel. Brother Mark: Is this the first mail or anything that you had received from your wife? Brother Mark: So in five years you never heard anything from her? Brother Mark: Did she pray for you often? Interpreter: Yes, of course she did. Brother Mark: She was a very faithful woman then, wasn’t she? Brother Mark: How old were your children when you were here in this camp? (To another person present:) Are you one of his children? Brother Mark: Do you remember when your father was in the camp? Interpreter: She was in 1955 and she is the youngest one. The oldest was eight years old what he was in prison. They were 8 and 5 and 3 years old and 2 years old. Brother Mark: So he had six children all together. Interpreter: At that time he had four children and two later. Brother Mark: Now how did your family get by and eat and make a living while you were in prison? Interpreter: His wife died six years ago. If she were alive she would tell. They had their ground which was rich and they would work it. Even now if you have ground you will not die. You work and you have something. Brother Mark: So they had to work and grow their own food? So the children and the mother worked in the land? Brother Mark: Is there anything else that you would like to tell us? Interpreter: One day while he was working that camp, he was one who could move this wood from place to place. One day there was a tall pine tree and it fell and hit this horse. It hit her on her neck. He was very big and he said, “Praise the Lord” that this horse didn’t die on the site. Because if this horse died he would be imprisoned for more years for if the horse died. But the horse died on the third day. In the first few days it became weak and weak and he said, “Praise the Lord” that it happened in such a way. He would pull as much wood as before but all the chiefs saw this horse die and it made a cry and died. God did it (so that he wouldn’t have to be imprisoned longer). Brother Mark: Can the other family tell me more that we should know about this man’s faith and how he made it through? Things that he has not told us, things that you know? Interpreter: He remembers again one time when he worked without a horse at that time. His hat was taken off by this and he had to struggle and he had a very strong wound in his hip and in his leg. Interpreter: He said, “Our father, he is very difficult. It is very difficult for him to operate with his sores. He remembers that it was very difficult for him to operate with him taped together. We heard so much of this when he suffered. It is not so simple as that we can imagine now. It was not so easy and the name of that camp was called Suhobezvodny, that means dry, without water, completely without water. That was the name of that camp. I don’t know whether they had water or not. Brother Mark: Tell him that we have appreciated very much his time that he has given and it is the spirit of his faith that we want to pass on to others who are younger. I missed on the first part of the tape, would you have him say his name again and how old? It was cut off. Interpreter: He is 88 years old, almost 89 now. Brother Mark: And his name is? Interpreter: Gerasim Chervony (translated from Ukrainian it means “red”). He is Gerasim “Red”. Brother Mark: Thank you very much. I want to take your picture too. Brother (Tom): Tell him – would it be all right if we prayed the Lord bless him? Brother Mark: We want to pray for him. Interpreter: He said it was here and he was in the hospital after he had this wound in the hip and then he was taken to another place and he had to go on. Brother (Tom): The God Who is Creator of all things, the God Who made every living creature, the God Who has kept you these many, many years, kept your testimony alive, your testimony may never die, it will go on forever. Many, many young people will hear it and will rally to the cross of Christ and join the army of God. So we pray now. For I speak to you in the name of Jesus. I speak to thee life, I speak hope to thee and I speak the blessings of God to thee. May the blessings of God enrich you and strengthen you and give you strength to continue on – in the name of Jesus and in the power of that great name of Jesus. I speak health and life to your body. I speak health to your body, to your bones, to your heart. I speak life to your stomach. I speak life to the marrow and the bones in your body. I pray that you shall not have to suffer any more, but that God will even touch your body today and ease the pain and make Himself even more real to your heart. So by the power invested in us by Almighty God: Be thou blessed, O man. Be thou strengthened, O man. Be thou encouraged, in the name of Jesus. Amen.